Chapter and Verse is the audio companion to Bruce Springsteen's forthcoming Born to Run autobiography. Springsteen selected the songs on Chapter and Verse to reflect the themes and sections of his memoir. It's a career-spanning compilation with 18 tracks, five of them never before released. 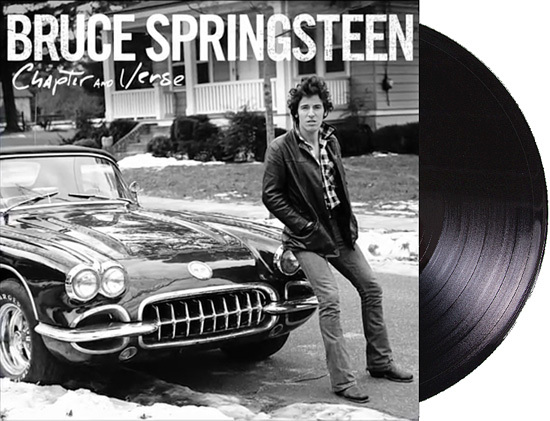 Frontloaded with all of these previously unreleased recordings on Side One, the album begins with two tracks from The Castiles, featuring a teenaged Springsteen on guitar and vocals: "Baby I," Bruce's first-ever studio recording, from 1966; and "Your Can't Judge a Book By the Cover," live in Freehold in 1967. Also appearing here for the first time: "He's Guilty (The Judge Song)" with Steel Mill, "Ballad of Jesse James" with the Bruce Springsteen Band, and a solo demo of "Henry Boy." From there, the collection traces Springsteen's career through the title track from 2012's Wrecking Ball. The package will also include lyrics and rare photos.